Select one of nine possible technical majors and the corresponding basic modules. Two major-specific required electives have to registered for. For mb-cn, the choice of required electives is predetermined by the required elective modules "Chinese" and "Technical communication in China". The remaining required elective can be selected freely. The non-technical module is predetermined by "Intercultural competence". The industrial internship is an engineering internship with the primary purpose to aquire some practical experience mainly related to mechanical engineering and/or process engineering. "mb-cn"-students carry out their student research paper as part of a semester abroad at our partner university in Qingdao under the supervision of German scientists. At the same time, they offer tutorials for Chinese students with German language skills: learning by doing! The Master's thesis is carried out at least in part at a plant of one of our German partner companies in China, optionally in conjuction with an internship. The summer school is a four-week program and takes place in September prior to the start of the semester in Qingdao. For more information on the Master’s program in Mechanical Engineering see pp. 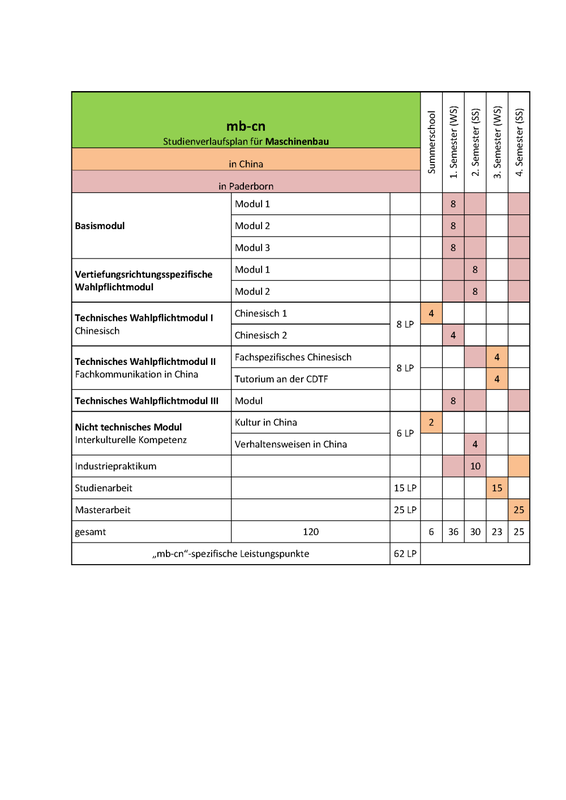 21 of the study guide as well as the flyer “Mechanical Engineering in China” (both available in German only).